Sunshine Motors is a Lease Here Pay Here program with you, the customer, in mind. With high quality customer service, we will give you peace of mind knowing all your transportation needs are taken care of!! 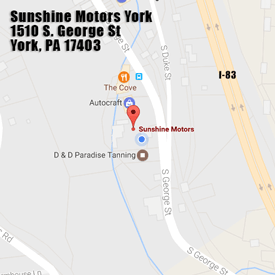 Sunshine Motors offers used cars in York PA with no credit checks, a maintenance plan, and warranties on all vehicles. We love finding vehicles for people. Tell us what you want and we will find it for you! Buy Here Pay Lease Car dealers can have a bad rap but our reviews speak for themselves. AutoTrader explains, “BHPH financing means that you arrange the loan and make payments on it at the dealership where you purchased the car. In other words, it’s a one-stop shopping process because the car dealer is also the finance company. Technically, we are Lease Here Pay Here, meaning that you are leasing the vehicle and have the option to buy it out at the end of your term. You can make arrangements to pay weekly, bi-weekly, or monthly depending on your financial situation and we will help you find the right car for what you need. We offer a convenient online payment center, pay via credit card over the phone, or you can bring is cash. Payments that are late subject to fees. Check out our Policies here to learn more! View our videos below to get a full understanding of how we work or fill out a Financing Application today!